The 2019 $5 Gold American Eagle is one of the most affordable, and economical of all United States gold bullion coins available. Perfect for entry-level investing, 1/10 Oz 2019 American Gold Eagles from Universal Coin & Bullion are suitable for investors who want to buy precious metals assets yet prefer not spending higher prices for larger gold bullion coins. They’re even perfect for young investors who are getting into the investment market. If you have children or grandchildren, get them started off the right way with patriotic American gold coins of their very own and teach them the importance of accumulating tangible assets. Real American Heritage – $5 Gold American Eagles have been around since the Reagan era. U.S. Government Guaranteed – Rest assured, Gold American Eagles are backed by the United States government. Investment-Grade Gold – American Gold Eagles are struck in 22k gold. Highly Liquid – American Gold Eagles are widely recognized and are easy to sell. Made in the U.S.A. – Bullion-quality Gold American Eagles are struck at the United States Mint in West Point, New York. Tangible wealth – Ever feel the heft of gold in your hands? That sensation is what holding real money feels like. $5 American Gold Eagles bear an obverse design by noted sculptor Augustus Saint-Gaudens featuring Lady Liberty in stride with the United States Capitol Building and a radiant sunrise behind her. The reverse design by Miley Tucker-Frost shows a family of American eagles huddled around their nest. Both designs have classic American appeal. The Saint-Gaudens design first appeared on United States gold coins in 1907, while the family of eagles motif has been seen on the American Gold Eagle coins since the bullion series debuted in 1986, during the heart of the historic two-term presidency of Ronald Reagan. What does tomorrow hold? Nobody knows, but gold has been a symbol of wealth, status, and power since Biblical times. Surely, gold will still be prized in the future. Shouldn’t you be putting gold away in your retirement account, too? You can – it’s called a precious metals Individual Retirement Account (IRA), and it allows you to substitute volatile paper assets with certain types of solid silver and gold bullion coins such as the $5 Gold American Eagle. Imagine stacking $5 Gold American Eagles in your IRA, earning wealth through your tangible, precious metals assets in a tax-deferred account. It’s possible with Gold American Eagles. Diversify your investment portfolio and hedge your bets against an unpredictable dollar, shaky world markets, and uncertain times in Europe, the Middle East, and beyond. Arm yourself against the rising tide of political and economic turmoil with tangible wealth – solid gold. Why Should You Buy 2019 $5 American Gold Eagles From Universal Coin & Bullion? The United States Mint makes hundreds of thousands of 1/10 OZ $5 Gold American Eagles every year, but we would allow only relatively few of those to ever enter our inventory. Why? Because some are dinged, scratched, or otherwise marred. We sell only the finest genuine Gold American Eagles around. Our longtime expert, Dr. Michael Fuljenz, knows quality when he sees it. The nationally acclaimed numismatic author, authenticator, speaker, and coin grading specialist proudly serves as America’s Gold Expert and has been seen on FOX Business News, Bloomberg TV and CNBC. Dr. Fuljenz and his team of skilled bullion experts allow nothing but the best bullion coins into our inventory, so you can be confident that you’ll receive authentic coins of superior quality. Additionally, you’ll receive free shipping on online orders over $99, so you can maximize your investment dollars when you buy Gold American Eagles from Universal Coin & Bullion. Your Gold Eagles will be shipped in secure and discreet packaging. We also offer an exceptional 100% satisfaction guarantee, and if you need any assistance our customer service team is here for you, 24/7. Expect nothing less from our company, which proudly maintains an A+ rating with the Better Business Bureau. Invest in $5 Gold American Eagles from Universal Coin & Bullion, and you’ll receive some of the finest bullion coins available. Contact us toll-free at 800.822.4653 to order your 2019 $5 Gold American Eagle coins before prices soar. The United States government had little trouble in choosing obverse and reverse designs for its new bullion coins in 1986. The Augustus Saint-Gaudens $20 double eagle design featuring a striding Liberty was already legendary in the mid 1980s and was a certain choice for the obverse of the $5 Gold American Eagle. Meanwhile, the reverse of the Gold American Eagles serves as the canvas for noted artist Miley Tucker-Frost, who graces the coins with her family of eagles design, which also incorporates the national motto IN GOD WE TRUST. The $5 Gold American Eagle debuted in 1986 during the core of the Reagan years and was an immediate hit with investors in the United States and throughout the world. Gold American Eagles remain popular all of these years later. Bankers stack them in their vaults, American workers include them in their IRAs, and prudent investors of every kind diversify their portfolios with Gold American Eagles to help protect their precious assets from the whims of the ever-changing domestic and world markets. Call a Universal Coin & Bullion account representative today to secure your 2019 $5 Gold American Eagle coins before prices increase. 2019 $10 Gold American Eagle coins are perfect for investors who want affordable, solid gold bullion coins. Gold Eagles are among the most popular gold bullion coins in the world because they have the backing of the United States government and are highly liquid – easy to sell virtually anywhere. United States gold coins boast 22-karat purity and are a top pick among precious metals investors. Nobody knows what’s coming tomorrow, but you can stake a claim in your future when you invest in gold coins. Gold has been treasured by humanity for thousands of years – it’s the enduring symbol of wealth. Paper currencies come and go, but precious metals are here to stay. You can store $10 Gold American Eagles in your precious metals Individual Retirement Account (IRA), which allows you to substitute paper assets with certain types of solid silver and gold bullion coins in a tax-deferred account. Diversify your portfolio with American Gold Eagles and shore up your investments against economic onslaughts from the unpredictable world markets. Arm yourself against the rising tide of turmoil with real wealth – solid wealth. Solid gold. Real American Heritage – $10 Gold American Eagles are well established, having launched during the Reagan era. Made in the U.S.A. – Bullion-quality $10 Gold American Eagles are struck at the United States Mint in West Point, New York. Real, Tangible Wealth – The irresistible heft of gold coins in your hands is what holding real riches feels like. Why Should You Buy 2019 $10 American Gold Eagles From Universal Coin & Bullion? There may be millions of $10 Gold American Eagles, but few would ever pass the discriminating standards of Universal Coin & Bullion. Our longtime expert Dr. Michael Fuljenz knows quality. The nationally recognized bullion coin dealer known as America’s Gold Expert has spent more than 30 years grading and authenticating coins and has shared his wisdom in the media, including FOX Business News, CBS MoneyWatch, and The Wall Street Journal. Dr. Fuljenz and his team of skilled bullion professionals scrutinize every $10 Gold Eagle that comes into our possession and they hand select only the finest specimens for inclusion in our inventory. You can rest assured when you buy Gold Eagles from Universal Coin & Bullion that you’ll receive some of the finest bullion coins around, period. You’ll also receive free shipping on online orders over $99, which helps maximize your investment dollars when you buy Gold American Eagles from Universal Coin & Bullion. Your Gold American Eagles will be shipped in secure, discreet packaging. We offer an outstanding 100% satisfaction guarantee, and our customer service team is here for you 24/7 if you have any questions. Our stellar products and service have helped us maintain an A+ rating with the Better Business Bureau. Contact us toll-free at 800.822.4653 to order your 2019 $10 Gold American Eagle coins before prices soar. It’s only a matter of time before the next big bullion boom. Get ahead of the game before it’s too late. 2019 $25 Gold American Eagle coins are ideal for investors who need cost-effective gold coins. Gold Eagles are one of the top gold bullion coins in the world. Why? Because they’re guaranteed by the United States government and are easy to sell virtually anywhere – they’re truly liquid assets. United States gold coins boast 22-karat purity and are a top pick among savvy precious metals investors. What’s coming tomorrow? Nobody knows. Yet, we do know this: gold has been treasured as a valuable commodity for thousands of years. Gold is solid wealth and is here to stay. That’s why many investors include gold coins in their precious metals Individual Retirement Accounts (IRAs). A precious metals IRA allows you to diversify your investment portfolio with solid gold coins – an ideal hedge against inflation and the tumultuous world markets that may pummel paper assets. Protect yourself against world turmoil and political chaos by diversifying with the solid wealth of gold coins. U.S. Government Guaranteed – Gold American Eagles are backed by the United States government – a guarantee worth its weight in gold. Real American Heritage – $25 Gold American Eagles were signed into law by President Ronald Reagan. Real, Tangible Wealth – Gold has heft in the hands – holding it is what owning real wealth feels like. Made in the U.S.A. – Bullion-quality $25 Gold American Eagles are made at the United States Mint in West Point, New York. $25 Eagles Are Affordable – Fractional gold coins such as the 1/2-ounce $25 Gold Eagle are more financially obtainable for many investors than 1 Troy ounce gold bullion coins. Investment–Grade Gold – American Gold Eagles are struck in 22k gold. Why Should You Buy 2019 $25 American Gold Eagles From Universal Coin & Bullion? 2019 $25 Gold American Eagles exist in quantity, but some don’t pass snuff at Universal Coin & Bullion. America’s Gold Expert Dr. Michael Fuljenz serves as our longtime numismatic expert and knows what quality and authenticity looks like. He’s nationally acclaimed and has been featured on FOX Business News, CNBC and has appeared in the The Wall Street Journal. Dr. Fuljenz and his team of bullion professionals examine every $25 Gold Eagle that comes into our possession and hand select only the best specimens for our inventory. So when you buy Gold Eagles them from Universal Coin & Bullion, you’ll receive the finest genuine bullion coins around, period. Don’t waste your hard-earned money on less-liquid, damaged bullion coins from some other dealers. Invest with an award-winning dealer. When you choose Universal Coin & Bullion, you’ll also receive free shipping on all online orders over $99, and that maximizes your investment dollars. Your Gold American Eagles will be shipped in secure, discreet packaging. We also offer an exceptional 100% satisfaction guarantee. Our customer service team is standing by, ready to assist you in any way they can. Our longstanding commitment to quality, service, and value has helped us to maintain a prestigious A+ rating with the Better Business Bureau. Contact us toll-free at 800.822.4653 and claim your 2019 $25 Gold American Eagle coins before prices increase. The next big bullion boom could happen at any time – get with the program before it’s too late. The common obverse of all Gold American Eagles bears the time-honored design from the Augustus Saint-Gaudens $20 gold coin, which was struck from 1907 through 1933. This legendary design depicts Lady Liberty striding before a radiant sunrise, a torch in her right hand and olive branch in her left. The reverse of the Gold American Eagles bears a patriotic design by Miley Tucker-Frost featuring a family of eagles huddled around their nest; the national motto IN GOD WE TRUST is prominently incorporated within the design. $25 Gold American Eagles are struck under the authorization of the Liberty Coin Act, which was signed into law by President Ronald Reagan on July 9, 1985. Gold Eagle coins are therefore prized by diehard investors and red-blooded Americans alike who crave patriotic gold bullion coins. These gold coins will stand the test of time, so be sure you include them in your portfolio while prices are still good. Call Universal Coin & Bullion today at 800.822.4653 and speak to one of our account representatives now to secure your 2019 $25 Gold American Eagle coins before prices increase. The 2019 $50 Gold American Eagle is modeled after the $20 Saint-Gaudens Double Eagle – one of the most beautiful coins ever minted. $50 American Gold Eagles feature an obverse design by noted sculptor Augustus Saint-Gaudens, whose striding Lady Liberty appeared on the classic $20 gold coins made from 1907 through 1933. Yet, the 1 Oz Gold American Eagle contains more gold, purer gold than any regular-issue pre-1933 U.S. gold coin and is therefore one of the most liquid and popular coins for bullion investors. 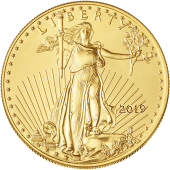 Patriotic American investors enjoy $50 Gold American Eagle coins for many reasons, including their symbolic designs. On the obverse, Lady Liberty is seen with a torch in her right hand and olive branch in her left as she strides before the United States Capitol Building while a gleaming sunrise radiates behind her. The reverse of the 1 Oz Gold American Eagle portrays a family of eagles in a timeless design by noted American artist Miley Tucker-Frost. $50 Gold American Eagles were approved by United States Congress in 1985 and have been minted under the authority of the Liberty Coin Act since 1986, when the United States was in the heart of the historic two-term Ronald Reagan presidency. $50 Gold American Eagle coins are beloved by investors who desire solid gold investments, crafted with American pride. These coins are an efficient way to own genuine gold United States bullion coins. American Gold Eagle coins are eligible for inclusion in tax-deferred precious metals Individual Retirement Accounts (IRAs). That means you can park your American gold bullion coins in a safe, secure retirement account while they amass wealth for your future. Why do countless savvy investors include bullion in their portfolios? To diversify their investments and hedge their bets against shaky world markets. Nobody can predict the future, but you can certainly put a stake in it when a portion of your portfolio is yoked with precious metals such as gold and silver. Why Should You Buy 2019 $50 American Gold Eagles From Universal Coin & Bullion? The United States Mint strikes millions of American Gold Eagles each year, but only a limited number would ever be good enough to enter our inventory at Universal Coin & Bullion. Every coin we sell is approved by nationally renowned coin dealer Dr. Michael Fuljenz, who serves as our longtime trusted expert. Dr. Fuljenz serves as America’s Gold Expert and has been seen on FOX Business News, CNBC and featured in The Wall Street Journal. He and his team of bullion specialists accept nothing less than the best authentic bullion coins into our inventory, so you can be confident in receiving products of superior quality. You’ll receive free shipping on any orders over $99, which means you’ll stretch your investment dollars even further when you buy Gold American Eagles from Universal Coin & Bullion. Your order will be shipped in secure, discreet packaging and will arrive safely at your location of choice. We also offer an outstanding 100% satisfaction guarantee, and if you need any assistance our customer care team is here for you. Demand nothing less than the best gold coins. Invest in genuine solid gold assets from Universal Coin & Bullion and you’ll receive the finest Gold American Eagles bullion coins available. Call us toll-free at 800.822.4653 for more information about the 2019 $50 Gold American Eagle and to order yours before prices rise. When the United States government began issuing gold bullion coins in 1986, it wasn’t difficult to decide which design to choose for the new coinage. The natural choice was Saint-Gaudens’ striding Liberty design, which had first appeared on gold coins nearly 80 years earlier and had become one of the world’s most acclaimed coin designs. The reverse of the Gold American Eagles feature a renowned design by celebrated American artist Miley Tucker-Frost. Her work centers on patriotism, religion, and family values, all of which are seen in her design featuring a family of American eagles and its accompanying inscription, the national motto IN GOD WE TRUST. The $50 Gold American Eagle debuted in 1986 during the Reagan years and was an immediate hit with investors throughout the United States and around the world. Gold American Eagles are still popular all of these years later. Many investors stack them in their vaults for the purpose of tangible assets ownership, though others will include the coins in their precious metals IRAs. Contact a Universal Coin & Bullion representative today for more information about $50 Gold American Eagles and to order yours before prices increase.